Grand Theft Auto was always on my to-do list, but the folks at Rockstar North beat me to it, including a hockey team logo in their upcoming GTA V game. It’s just a parody of the Los Angeles King logo, but still! I thought I’d include their design here for the Los Santos Kings. My only change would be to include the city name, which I did above (smaller inset logo). Up next are the Vice City Gators. With Vice City being the GTA equivalent of Miami, I felt a logo that paid tribute to the Florida Gators (name) and Miami Hurricanes (colors) would do the trick. I also used a jersey template similar to the Florida Panthers. A Pittsburgh Penguins-style logo was used, allowing me to put a “V” in the triangle. An alternate logo without the roundel/text is included above. And lastly here are the Liberty City Americans, a GTA version of the New York Rangers with a bit of Team USA thrown in. I thought it would be neat to depict the city skyline doing an impression of the American flag. A simpler version of the logo is placed inset. The five stars in the sky represent the highest wanted level you can earn in the games. As for the secondary logos for all three designs: – The Rockstar North logo is placed on the back neck. It’s one of my favorite logos in all of gaming. It also reminds me of the Starter logo. – The GTA logo is a take on the 80’s – 90’s era CCM logo. 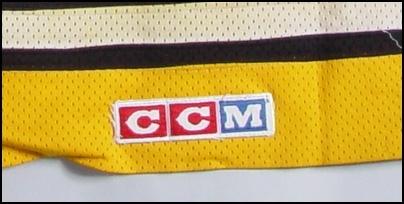 CCM was the primary manufacturer of NHL jerseys back then. The CCM-era NHL jerseys are a huge source of nostalgia for me. – The pre-2006 NHL logo gets the Rockstar treatment too. It works because Rockstar uses a very similar orange to the old NHL logo. I was finally able to add something here that I wished the NHL would’ve done: I added a puck beside the ‘L’, because that letter always looked like a hockey stick to me. The only cities not covered here are from San Andreas: San Fiero (San Francisco), and Las Venturas (Las Vegas). I have teams in mind for both, so hopefully one day down the road I’ll get to them. Posted on July 8, 2013, in Geeky Jerseys, Hockey Jersey Design and tagged CCM, Geeky Hockey Jerseys, Grand Theft Auto, GTA III, GTA IV, GTA San Andreas, GTA V, GTA Vice City, Hockey Jersey Design, Rockstar, Sports Teams, Video Games. Bookmark the permalink. 5 Comments. Love ’em. Always enjoyed the GTA games. Ever thought about trying Saints Row? I very much hope the Liberty City jersey goes on sale. I would buy one in a heartbeat.